For a small country, Belgium has quite a few outsized attractions. 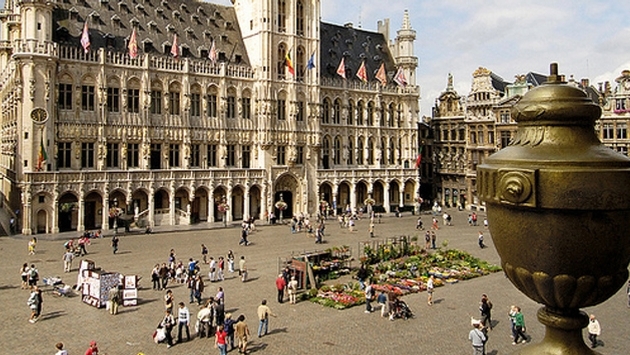 It is known for beautifully preserved medieval cities, the cosmopolitan European Union capital of Brussels, dense green forests and a bracing North Sea coast, and a surprising number of signature gastronomic delights from beer and chocolate to waffles and French fries, which despite their name were invented in Belgium. But Belgium also has a deeply somber side as well, since it was the site of some of World War I’s most horrific battles. The world’s first global conflict was dubbed with heartbreaking optimism as the War to End All Wars. Between 1914 and 1918 it claimed more than one million soldiers wounded, missing or killed in action. Much of the fighting took place amid the green fields of Flanders in northern Belgium, the country’s Dutch-speaking region. Reminders of the carnage are scattered throughout the region in battlefields, cemeteries, monuments and museums. This year Belgium begins a four-year remembrance project to mark the war’s 100th anniversary. The Great Centenary features a host of special events, commemorations, exhibitions, and new and renovated museums. The Flemish government has invested 15 million euros (more than $19 million) in museums, visitor centers and World War I sites, and another seven million euros (more than $9 million) in special events. While Canadians, whose troops were key to the British Commonwealth army, continue to remember World War I, the conflict has less resonance for Americans, who entered the war near its end in 1918. But that fact presents American travel agents with an opportunity to sell Flanders as something different—a lesser-known but compelling destination with a particularly meaningful hook. Of course, visitors won’t just come to Belgium for the World War I events, but they can combine them with visits to Flanders’ art cities, which offer rich historic, cultural and gastronomic experiences. Flanders is an extremely compact region, roughly the size of Connecticut, so it’s a no-brainer to combine a visit to Flanders Fields with nearby historic cities like Bruges, Ghent, Brussels or Antwerp. All of those destinations are an hour or less away from each other. Despite America’s smaller role in World War I, the U.S. contribution and sacrifice was critical and is “visible” throughout Flanders. Regardless of nationality, age or personal connection to the Great War, a visit to Flanders Fields is an emotional experience for any human being. Its historical significance and message of “no more war” remains current today. One of the most emotional and unique World War I experiences is the Last Post Ceremony at the Menin Gate in the medieval city of Ypres (Ieper in Dutch). Every single evening since 1928, at exactly 8 p.m., volunteer buglers have sounded the Last Post, which traditionally is the last salute to the fallen soldier, at the Menin Gate. Shaped like a Roman triumphal arch, the memorial gate displays the names of nearly 55,000 soldiers missing in action from Britain’s then-extensive colonial empire. It was built in the location of the city’s old medieval gate, through which the troops marched out to defend the Ypres Salient, the longest frontline in Flanders. Anyone can attend the ceremony. In fact, visitors can apply in advance to the Last Post Association (www.lastpost.be) to be among the participants laying wreaths at the ceremony. On Armistice Day, Nov. 11, there’s a Special Last Post Ceremony, a Poppy Parade and a Great War Remembered concert at St. Martin’s Cathedral. The In Flanders Fields Museum (www.inflandersfield.be), also in Ypres, is itself a testament to the spirit of the Flemish people. Completely destroyed during the war, the museum was faithfully rebuilt as a near-perfect copy of the medieval Gothic Cloth Hall. The state-of-the-art interactive museum examines the personal as well as military and historic sides of the war through objects, artifacts, photographs, videos, diaries, and personal impressions of soldiers and artists. Among the museum’s special Centenary events is an exhibition on War and Trauma, which is currently on display through June 29, 2014, detailing the European armies’ treatment of the growing stream of casualties and European society’s slow recognition of the war’s psychological trauma. The area surrounding Ypres is home to more than 150 military cemeteries. Built in the 1920s, these burial grounds are an evocative presence in Flanders with their row upon row of headstones and their collection of stunning monuments. One of the most famous is the Essex Farm Cemetery and A.D.S. (advanced dressing station). Here the Canadian military doctor John McCrae wrote the iconic World War I poem “In Flanders Fields.” The poem wrenchingly mentions the red poppy, which thrived in those fields. But it was an American professor and humanitarian, Moina Michael, who came up with the idea of using the poppy as the symbol of remembrance for those who served in World War I. Nearby is Tyne Cot, the resting place of nearly 12,000 British Commonwealth soldiers and the largest of any Commonwealth cemetery for either the First or Second World Wars. Those buried here died capturing the ruined village of Passchendalele. The Memorial Museum of Passchendalele (www.passchendalele.be), housed in a striking chateau in Zonnebeke, deals with that brutal 1917 battle. An additional museum building, which opened in July 2013, details the contributions of the different Commonwealth nations involved in the battle. Three new walking trails are also being constructed, including one to Tyne Cot cemetery. The American presence in World War I also is memorialized in Flanders. The Flanders Field American Cemetery in Waregem occupies six acres on a former battlefield where American forces fought during the Ypres-Lys offensive. It’s the only World War I American cemetery in Belgium and the smallest of the American military cemeteries in Europe. Ceremonies are held by the American Battle Monuments Commission (www.abmc.gov) every Memorial Day at the site. Nearby, the relatively undiscovered Flemish medieval city of Mechelen has more than 300 listed buildings and monuments, including eight gothic and baroque churches. It’s also home to Anker, one of Belgium’s oldest operating breweries. Heavily bombed during the war, the city’s Museum Hof van Busleyden (www.stedelijkemuseamechelen.be) is mounting a Mechelen’s War Artists exhibition from May 17 to Sept. 28, 2014. A unique place to stay in Mechelen is the Martin’s Patershof (www.martins-hotels.com), a converted 19th-century Franciscan church. The hotel has retained the former church’s stained glass and supporting columns. Mechelen also has opened a major new museum addressing not the Great War but World War II. That might be fitting, given that most historians see the seeds for the Second World War in the Great War. Opened in December 2012, the Kazzerne Dossin, a memorial, museum and documentation center on the Holocaust and human rights, represents both a dark page in Belgian history and a moving tribute to the Jews and gypsies murdered during the war. The memorial is located in one wing of Kazzerne Dossin (www.kazernedossin.eu), a former army barracks that the Germans set up as a transit camp and deportation center for the more than 25,000 sent to the death camp at Auschwitz-Birkenau between 1942 and 1944. Across the street a huge new contemporary museum details Belgian complicity in the persecution of Jews and gypsies. There are photographs, files and testimonies, and the complex’s documentation center features photographs of nearly 80 percent of the deportees. To the east of Mechelen lies Ghent, Flanders’ biggest university town boasting a dynamic cultural and social scene. It has yet to be discovered by crowds of tourists, and so it’s easier for visitors to enjoy its hundreds of historic buildings, as well as its 100 churches and a score of fine museums. The Museum Dr. Guislain (www.museumdrguislain.be) plans to have its own War and Trauma Centenary exhibition focusing on psychiatry. Ghent feels like a more lived-in version of Bruges, its celebrated neighbor to the north. The best-preserved example of medieval Flanders, Bruges is a UNESCO World Heritage site. A visit to its 13th-century center with cobblestoned streets, canals and Gothic architecture is an authentic time travel experience. Close to the city’s medieval marketplace is the Pandhotel (www.pandhotel.com), a small boutique property converted from an 18th-century carriage house. Then there’s Brussels, a vibrant, cosmopolitan city that has much to offer to historically and architecturally minded visitors. The capital of Belgium and the European Union, Brussels has at its center the magnificent Grande Place, a 13th-century merchants market. In the city center, the luxury Hotel Dominican (www.thedominican.be) is built on the site of a 15th-century Dominican abbey and features original stone floors, high ceilings and sweeping archways. Brussels is weighing in with its own Great War special events. The Museum of Europe (www.expo-europe.be) will mount The Birth of the 20th Century, a major exhibit on the consequences of the war, set for viewing October 2014 to April 2015. In the spring of 2015, an exhibition on the Avant-Garde and the Great War will be staged at the Centre for Fine Arts (www.bozar.be). Brussels also has commissioned 1,000 Voices for Peace, a large-scale symphony oratorio as part of the annual Flanders Festival (www.festival.be). Scheduled for November 1914, the concert will include choirs from Belgium and another 35 countries involved in the war. As its organizers note, Indians fought on the hills around Ypres, Senegalese died in the battle of Diksmuide and the Algerian cavalry trained in the dunes around Koksijde. For more information, visit www.visitflanders.us.